What this report finds: This report looks at trends in chief executive officer (CEO) compensation, using two different measures. The first measure includes stock options realized (in addition to salary, bonuses, restricted stock grants, and long-term incentive payouts). By this measure, in 2017 the average CEO of the 350 largest firms in the U.S. received $18.9 million in compensation, a 17.6 percent increase over 2016. The typical worker’s compensation remained flat, rising a mere 0.3 percent. The 2017 CEO-to-worker compensation ratio of 312-to-1 was far greater than the 20-to-1 ratio in 1965 and more than five times greater than the 58-to-1 ratio in 1989 (although it was lower than the peak ratio of 344-to-1, reached in 2000). The gap between the compensation of CEOs and other very-high-wage earners is also substantial, with the CEOs in large firms earning 5.5 times as much as the average earner in the top 0.1 percent. The surge in CEO compensation measured with realized stock options was driven by the stock-related components of CEO compensation (stock awards and cashed-in stock options), not by changes in salaries or cash bonuses. Because the decision to realize, or cash in, stock options tends to fluctuate with current and potential stock market trends (as people tend to cash in their stock options when it is most advantageous to do so), we also look at another measure of CEO compensation, to get a more complete picture of trends in CEO compensation. This measure tracks the value of stock options at the time they are granted. By this measure, CEO compensation rose to $13.3 million in 2017, up from $13.0 million in 2016. By either measure, CEO compensation is very high relative to the compensation of a typical worker—and an earner in the top 0.1 percent. Chief executive officers (CEOs) of the largest firms in the U.S. earn far more today than they did in the mid-1990s and many times what they earned in the 1960s or late 1970s. They also earn far more than the typical worker, and their pay has grown much more rapidly. Using a measure that includes stock options realized (as described below), CEO pay grew a remarkable 17.6 percent from 2016 to 2017, reaching $18.9 million on average in 2017. CEO compensation grew strongly because of the large stock awards given to CEOs and their ability to sell previously granted stock options in a rising stock market. The rapid growth of CEO compensation followed two years of decline. It allowed CEO compensation to grow 71.7 percent in the recovery since 2009, reaching a level just 3.3 percent below the high compensation levels reached in 2007, before the Great Recession. In contrast, the average workers’ annual compensation grew at an annual rate of just 2.1 percent between 2009 and 2017—and by a mere 0.3 percent between 2016 and 2017. Average CEO compensation attained its peak in 2000, at the height of the late 1990s stock bubble, at $21.0 million (in 2017 dollars)—344 times the pay of the typical worker. The CEO-to-worker pay ratio dropped to 188-to-1 in 2009, in the wake of the financial crisis but rose to 312-to-1 in 2017, as worker compensation has stagnated in the recovery. CEO pay continues to be dramatically higher than it was in the decades before the turn of the millennium. The CEO-to-average-worker pay ratio was 112-to-1 in 1995, 58-to-1 in 1989, 30-to-1 in 1978, and 20-to-1 in 1965. This report is part of an ongoing series of annual reports monitoring trends in CEO compensation. To analyze current trends, we use two measures of compensation. The first measure includes stock options realized (in addition to salary, bonuses, restricted stock awards, and long-term incentive payouts). Because stock-options-realized compensation tends to fluctuate with the stock market (as people tend to cash in their stock options when it is most advantageous to do so), we also look at another measure of CEO compensation, to get a more complete picture of trends in CEO compensation. This measure tracks the value of stock options granted. CEO pay has historically been closely associated with the health of the stock market, although this connection seemed to disappear in 2015 and 2016, when CEO compensation fell even though stock prices rose. The tight relationship between stock prices and CEO compensation was reestablished in 2017 as the 17.6 percent growth in CEO compensation offset the slight losses in the past few years. The tight link between stock prices and CEO compensation indicates that CEO pay is not being established by a “market for talent,” as pay surged with the overall rise in profits and stocks, not with the better performance of a CEO’s particular firm relative to his or her competitors. Amid a healthy recovery on Wall Street following the Great Recession, CEOs enjoyed outsized income gains even relative to other very-high-wage earners (those in the top 0.1 percent), although outsized CEO pay growth has had spillover effects, pulling up the pay of other executives and managers, who constitute a larger group of workers than is commonly recognized.1 Consequently, the growth of CEO and executive compensation overall was a major factor driving the doubling of the income shares of the top 1 percent and top 0.1 percent of U.S. households from 1979 to 2007 (Bakija, Cole, and Heim 2012; Bivens and Mishel 2013). Since then, income growth has remained unbalanced. As profits and stock market prices have reached record highs, the wages of most workers have continued to stagnate, including in the current recovery (Bivens et al. 2014; Gould 2018). Using the stock-options-realized measure, the average compensation for CEOs of the 350 largest U.S. firms was $18.9 million in 2017. Compensation was up 17.6 percent (from $16.0 million) since 2016 and 71.7 percent (from $11.0 million) since the recovery began in 2009. Using the stock-options-granted measure, the average compensation for CEOs of the 350 largest U.S. firms was $13.3 million in 2017, up 1.7 percent from $13.0 million in 2016. From 1978 to 2017, inflation-adjusted compensation based on realized stock options of the top CEOs increased 1,070 percent. The increase was more than 61 percent greater than stock market growth and substantially greater than the painfully slow 11.2 percent growth in a typical worker’s annual compensation over the same period. Measured using the value of stock options granted, CEO compensation rose 979 percent from 1978 to 2017. Using the stock-options-realized measure, the CEO-to-worker compensation ratio was 20-to-1 in 1965. It peaked at 344-to-1 in 2000. In 2017 the figure rose to 312-to-1, up from 270-to-1 in 2016—far higher than at any point in the 1960s, 1970s, 1980s, or 1990s. 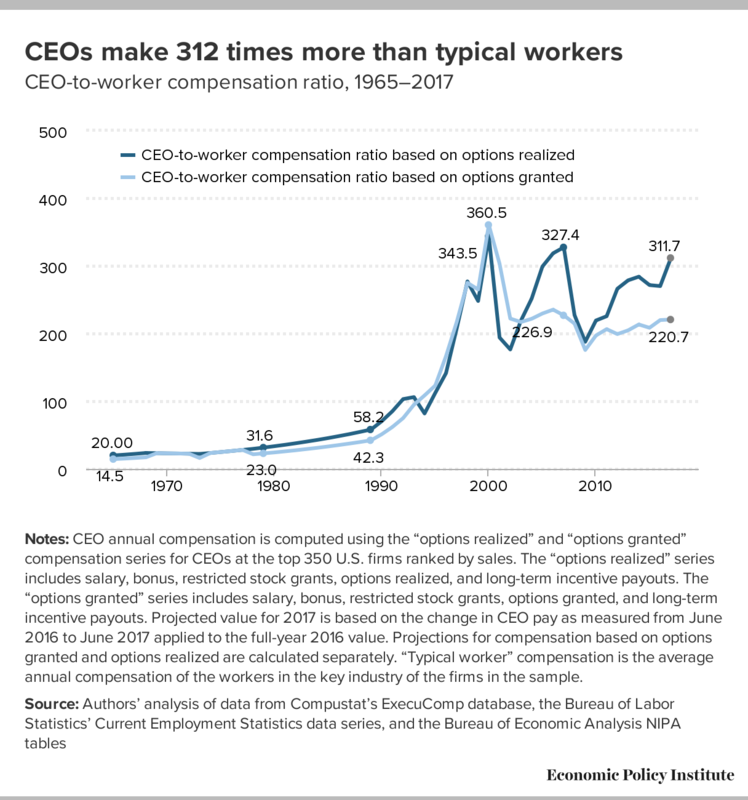 Using the stock-options-granted measure, the CEO-to-worker compensation ratio rose to 221-to-1 in 2017 (from 220-to-1 in 2016), significantly lower than its peak of 360-to-1 in 2000 but still many times higher than the 42-to-1 ratio of 1989 or the 15-to-1 ratio of 1965. Over the last three decades, compensation for CEOs based on realized stock options grew far faster than that of other highly paid workers (those earning more than 99.9 percent of wage earners). CEO compensation in 2016 (the latest year for which data on top wage earners are available) was 5.45 times greater than wages of the top 0.1 percent of wage earners, a ratio 2.27 points higher than the 3.18 ratio that prevailed over the 1947–1979 period. This wage gain alone is equivalent to the wages of more than two very-high-wage earners. The fact that CEO pay has grown far faster than the pay of the top 0.1 percent of wage earners indicates that CEO compensation growth does not simply reflect the increased value of highly paid professionals in a competitive race for skills (the “market for talent”) but rather the presence of substantial economic rents. CEO compensation appears to reflect not greater productivity of executives but the power of CEOs to extract concessions. Consequently, if CEOs earned less or were taxed more, there would be no adverse impact on output or employment. 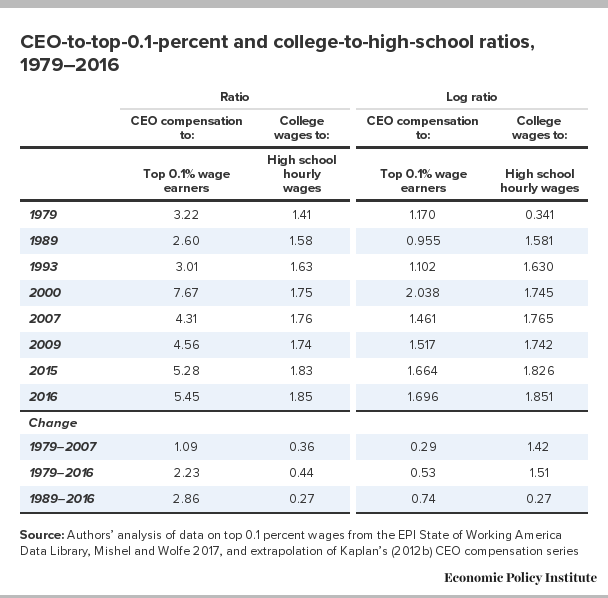 Over the last three decades, CEO compensation increased more relative to the pay of other very-high-wage earners than did the wages of college graduates relative to the wages of high school graduates. This finding indicates that the escalation of CEO pay does not simply reflect a more general rise in the returns to education. *CEO annual compensation is computed using the “options realized” and “options granted” compensation series for CEOs at the top 350 U.S. firms ranked by sales. The “options realized” series includes salary, bonus, restricted stock grants, options realized, and long-term incentive payouts for CEOs at the top 350 U.S. firms ranked by sales. The “options granted” series includes salary, bonus, restricted stock grants, value of options granted, and long-term incentive payouts. **Annual compensation of the workers in the key industry of the firms in the sample. ***Based on averaging specific firm ratios and not the ratio of averages of CEO and worker compensation. Notes: Projected value for 2017 is based on the change in CEO pay as measured from June 2016 to June 2017 applied to the full-year 2016 value. Projections for compensation based on options granted and options realized are calculated separately. “FH” denotes preliminary values from the “first half” of the year. Data available through Compustat for 2017 contain an abnormally large number of missing values for stock awards (evaluated at fair value), which are part of the compensation measures tracked in our analyses. To adjust for this problem, we relied on a similar corresponding variable, the value of stock awards, to extrapolate the 2016 levels of stock awards at fair value to 2017 (Box A provides details on the measurement of stock awards in the data presented for 2017). In calculating the value of CEO compensation based on stock-related awards for this year’s report, it became obvious that a significant number of firms were missing values in the raw Compustat data for the “fair value” of stock awarded under plan-based awards (stock_awards_fv). Compustat representatives confirmed that there were abnormalities in the most recent year’s data. These missing data for 2017 caused our measure of CEO compensation to artificially fall (in nominal terms) by nearly $2 million on average per CEO. In contrast, the value of a comparable variable for stock awards (not adjusted for “fair value”) grew by nearly $1 million per CEO. To compensate for the missing data, we relied on trends in the cost of stock awards that were charged to the company (stock_awards) for the same firm in the first half of 2016 and of 2017. Stock awards are a reliable metric of trends for the fair value of stock awards: Over the last 10 years, the value of stock awards and the fair value of stock awards were within $1,000 of each other roughly 62 percent of the time. Not surprisingly, therefore, the levels and changes in the two variables are similar. Consequently, where data for fair value values were missing in the 2017 data, we computed the percentage growth in the cost of stock awards (stock_awards) between 2016 and 2017 and applied that growth to the previous year’s fair value number for that firm to obtain an estimate of the fair value of stock awards in 2017. CEO compensation reported in Table 1, as well as throughout the report, is the average compensation (in 2017 dollars) of the CEOs of the 350 publicly owned U.S. firms (i.e., firms that sell stock on the open market) with the largest revenue each year for which executive compensation data are available.3 For comparison, Table 1 also presents the average annual compensation (wages and benefits of a full-time, full-year worker) of a private-sector production/nonsupervisory worker (a group covering more than 80 percent of payroll employment), allowing us to compare CEO compensation with that of a “typical” worker. From 1995 onward, the table also identifies the average annual compensation of the production/nonsupervisory workers corresponding to the key industry of the firms included in the sample. We take this compensation as a proxy for the pay of typical workers in these particular firms and use it to calculate the CEO-to-worker compensation ratio for each firm. The history of CEO compensation since the 1960s is as follows. Although the stock market—as measured by the Dow Jones Industrial Average and S&P 500 Index and shown in Table 1—fell by roughly half between 1965 and 1978, CEO pay increased by 78.7 percent. Average worker pay saw relatively strong growth over that period (relative to subsequent periods, not relative to CEO pay or the pay of other earners at the top of the wage distribution). Annual worker compensation grew by 19.9 percent from 1965 to 1978, only about a fourth as fast as CEO compensation growth. CEO compensation grew strongly throughout the 1980s but exploded in the 1990s. It peaked in 2000, at about $21.0 million, a 261 percent increase over just five years earlier in 1995 and a 1,206 percent increase over 1978. This latter increase even exceeded the growth of the booming stock market (513 percent for the S&P 500 and 439 percent for the Dow) between 1978 and 2000. In stark contrast to both the stock market and CEO compensation, private-sector worker compensation increased just 0.7 percent over the same period. The fall in the stock market in the early 2000s after the bubble burst led to a substantial paring back of CEO compensation. By 2007, however, when the stock market had mostly recovered, average CEO compensation reached $19.5 million, just $1.5 million less than its 2000 level. Note that Table 1 provides a projection for data for 2017. The data available for 2017 are limited to the executive compensation disclosed by firms filing proxy statements through June of 2017. To provide data for CEO compensation in 2017 that are consistent with the historical data, we construct our estimates by looking at the growth of compensation from 2016 to 2017 using the first-half-year samples of data available each year and then applying that growth rate to the compensation for 2016 based on the full-year sample. This method corrects for the fact that full-year samples show higher compensation than samples for the first half of a year. It allows us to avoid artificially lowering the estimated change in this year’s CEO compensation relative to last year’s.4 Using the data through the first half for both years, average CEO compensation (based on stock options realized) was $17.9 million in 2017, up $2.7 million (17.6 percent) from the $15.2 million average in the first half of 2016. Using the value of options granted reveals a 1.7 percent increase, from $13.0 million in 2016 to $13.3 million in 2017. We use the projected 2017 CEO compensation as the basis for examining changes in CEO compensation over time. For the period 1978–2017, CEO compensation based on options realized increased about 1,070 percent—more than 60 percent faster than stock market growth (either the Dow Jones or S&P 500) and substantially faster than the painfully slow 11.2 percent growth in the typical worker’s compensation over the same period. CEO compensation based on the value of stock options granted grew 979 percent over this period. CEO compensation in 2017 remained below its peak in 2000, which occurred at the end of a strong economic boom that included huge growth in the stock market that many believed reflected a technology stock bubble. The run-up in stock prices had a corresponding effect on CEO compensation. When the bubble burst, CEO compensation was deflated as well. Figure A shows how CEO compensation measured using realized stock options historically fluctuated in tandem with the stock market, as measured by the S&P 500 Index, confirming that CEOs tend to cash in their options when stock prices are high. The financial crisis of 2008 and the accompanying stock market tumble knocked CEO compensation based on realized stock options down 44 percent from 2007 to 2009. By 2014 the stock market had recouped all of the ground lost in the downturn. Not surprisingly, CEO compensation based on realized stock options also made a strong recovery. From 2014 to 2016, however, CEO pay based on realized stock options deteriorated, a departure from earlier trends. The sharp spike in CEO compensation in 2017 reestablished the close long-term connection between stock market growth and CEO compensation. As shown in the next section, growth in CEO compensation in 2017 was driven by the stock-related components of CEO pay (stock awards and realized stock options). Notes: CEO annual compensation is computed using the “options realized” compensation series, which includes salary, bonus, restricted stock grants, options realized, and long-term incentive payouts for CEOs at the top 350 U.S. firms ranked by sales. Projected value for 2017 is based on the change in CEO pay as measured from June 2016 to June 2017 applied to the full-year 2016 value. The normally tight relationship between overall stock prices and CEO compensation, as shown in Figure A, casts doubt on the theory that CEOs are enjoying high and rising pay because their individual productivity is increasing (because they head larger firms, adopted new technology, or other reasons). CEO compensation often grows strongly when the overall stock market rises and individual firms’ stock values rise along with it. This is a marketwide phenomenon, not one of improved performance of individual firms: Most CEO pay packages allow pay to rise whenever the firm’s stock value rises and permit CEOs to cash out stock options regardless of whether the rise in the firm’s stock value was exceptional relative to comparable firms in the same industry. Analyses of the underlying components of CEO compensation indicate that the two items closely linked to stocks and stock prices (realized value from exercising stock options and stock awards) fueled the sharp jump in CEO compensation in 2017. In contrast, average salaries among the CEOs in our sample fluctuated only marginally since 2007, and average bonuses (which have become more volatile) accounted for less than 5 percent of executive compensation in recent years. To analyze the shifts in the components of CEO compensation from 2016 to 2017 we compared compensation from the first half of 2017 with that of the comparable period in 2016. 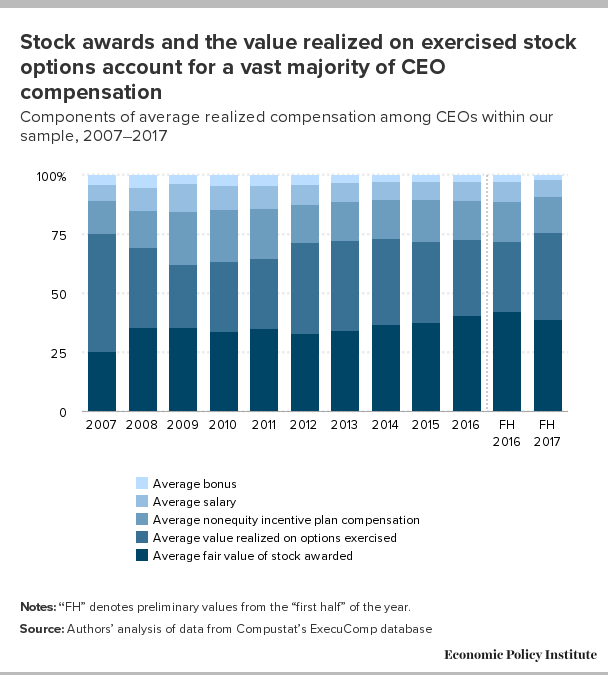 Figure B shows the average value of each of the main components of CEO compensation relative to total realized compensation in a given year, i.e., shares of total compensation. The value of exercised stock options accounted for the vast majority (78.9 percent) of the year-over-year growth in CEO compensation from 2016 to 2017 and grew by 47.1 percent. By contrast, the value realized on options exercised fell more than 15 percent between 2013 and 2016, a period when overall CEO compensation was essentially flat. The sharp growth in realized stock options in 2017 occurred as executives cashed out their accumulated unexercised options, as indicated by the sharp decline in unexercised stock options. In other words, CEOs cashed in on a rising stock market in 2017 (up 15–19 percent, depending on the stock index, as shown in Table 1—much faster growth than in the previous two years). The value of options exercised was still lower than at its peak (in 2007). Notes: “FH” denotes preliminary values from the “first half” of the year. The other stock-related compensation component, the fair value of stock awarded, accounted for 40.7 percent of CEO compensation in 2016 and grew by 8.4 percent. Growth of stock awards accounted for 20.2 percent of the growth of CEO compensation from 2016 to 2017. The two stock-related components together accounted for nearly all (99.1 percent) of the growth of CEO compensation from 2016 to 2017. Smaller components of CEO compensation stagnated or fell. Both salaries and bonuses declined, by 2.7 and 13.8 percent, respectively. These components accounted for 10.5 percent of CEO compensation in 2016. Nonequity incentive plan compensation, or long-term incentives, accumulated by CEOs accounted for 16.7 percent of total realized compensation in 2016. This component of realized compensation rose 4.2 percent. These recent year-over-year trends largely echo longer-term trends. Nearly half of the growth in realized CEO compensation since 2009 came from increases in the value of options exercised; another two-thirds reflected the growth in stock awards. These components of CEO compensation together accounted for more than all the growth because the remaining components declined: the salaries and bonuses provided to CEOs fell between 2009 and 2017. 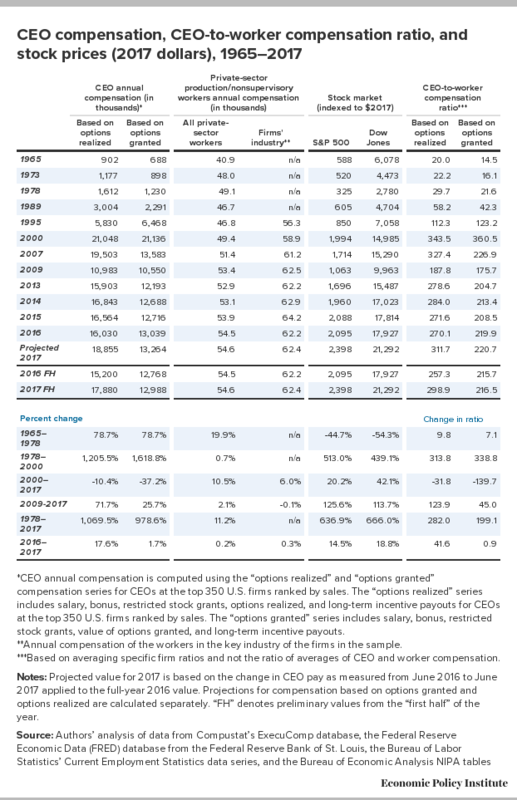 Table 1 presents historical and current trends in the ratio of CEO-to-worker compensation, using both measures of CEO compensation. This ratio, which illustrates the increased divergence between CEO and worker pay over time, is computed in two steps. The first step is to construct, for each of the 350 largest U.S. firms, the ratio of the CEO’s compensation to the annual average compensation of production and nonsupervisory workers in the key industry of the firm (data on the pay of workers at individual firms are not available).5 The second step is to average that ratio across all 350 firms. The last two columns in Table 1 show the resulting ratio for both measures of CEO pay. We adjust the ratio for 2017 to reflect the percentage point growth between the first-half-year samples in 2016 and 2017 and apply that growth to the ratio estimated for the full-year sample in 2016, in order to make the 2017 ratio consistent with the historical data. Trends before 1995 are based on the changes in average top-company CEO and economywide private-sector production/nonsupervisory worker compensation. The trends are presented in Figure C.
Notes: CEO annual compensation is computed using the “options realized” and “options granted” compensation series for CEOs at the top 350 U.S. firms ranked by sales. The “options realized” series includes salary, bonus, restricted stock grants, options realized, and long-term incentive payouts. The “options granted” series includes salary, bonus, restricted stock grants, options granted, and long-term incentive payouts. Projected value for 2017 is based on the change in CEO pay as measured from June 2016 to June 2017 applied to the full-year 2016 value. Projections for compensation based on options granted and options realized are calculated separately. “Typical worker” compensation is the average annual compensation of the workers in the key industry of the firms in the sample. The Securities and Exchange Commission (SEC) now requires publicly owned firms to provide a metric for the ratio of CEO compensation to that of the median worker, as mandated by the Dodd-Frank financial reform bill of 2010. Those ratios differ from those in this report in several ways. First, because of limitations in data availability, the measure of worker compensation in our ratios reflects workers in a firm’s key industry, not workers actually working for the firm. Second, our measure reflects an exclusively domestic workforce; it excludes the compensation of workers in other countries who work for the firm. Third, our metric is based on hourly compensation annualized to reflect a full-time, full-year worker (i.e., multiplying the hourly rate by 2,080). In contrast, the measures firms provide to the SEC can be part-year or part-time workers. As a result, comparisons across firms reflect not only pay differences but also differences in annual work hours. There is value in the new metrics provided to the SEC, but the measures we rely on allow us to make better comparisons across firms and across time. Box B provides more information on the new ratios firms are providing to the SEC. Beginning in 2018, all publicly traded companies are required to disclose CEO total compensation alongside the median annual total compensation of all employees other than the CEO in annual proxy statements submitted to the Securities and Exchange Commission. In addition, they are to provide the ratio of CEO-to-worker compensation (SEC 2015). Advocates, investors, and researchers alike have welcomed the disclosure of this information, because these disclosures offer previously unavailable insight into compensation inequality within firms. Historically, constructing a firm-specific CEO-to-worker pay ratio was impossible without the cooperation of the firm, although sector-specific estimates were possible (see Mishel and Schieder 2017). The new CEO-to-worker compensation ratios contained in this year’s proxies shine a ray of sunlight onto the compensation of the typical worker. According to the authors of a report titled Rewarding or Hoarding? An Examination of Pay Ratios Revealed by Dodd-Frank, from the office of Congressman Keith Ellison (D-Minn.), “These new data give us a much clearer picture as to which corporations are sharing the wealth and which are not” (Staff of Congressman Keith Ellison 2018). Fierce business resistance to the mandate to report the CEO-to-worker compensation ratio watered down their potential use. Many corporations implausibly contended that constructing these ratios was too difficult. The SEC gave these claims far too much credence, providing firms tremendous leeway in how to construct the ratios. This SEC capitulation diminished the utility of these new median worker compensation measures for making comparisons across firms and will affect the utility of comparing them over time when additional years of data are available. Specifically, the SEC’s rule grants firms significant discretion in reporting median worker pay, which makes the reported ratios incompatible across firms. A company’s reported “median worker” may, for example, work part time or full time, reside in the U.S. or abroad, and have worked for the firm for a limited number of weeks during the previous year. The data on median compensation are not provided on a per hour basis or annualized to that of a full-time, full-year worker. Without such information, or simply the annual hours worked by the median worker, it is not possible to standardize the compensation for comparisons across firms. In addition, firms may not adhere to the same metric each year, limiting the ability to make historical comparisons in the future. Given these limitations, this year’s annual EPI examination of CEO compensation will once again provide an annual estimate of CEO-to-worker pay. Our methodology (described in Sabadish and Mishel 2013) has a number of advantages over the SEC’s calculated ratio. First, our methodology compares CEO compensation to the median worker in the main industry of the CEO’s company. It thereby eliminates artificial reductions in the CEO-to-worker pay ratio that could arise from the extensive use of subcontracting. Second, our worker compensation series reflects annualized compensation (multiplying an estimate of hourly compensation by 2,080 hours), eliminating the ambiguity that arises when weeks worked and hours per week are not specified or differ across firms. This assumption also makes our ratio a conservative estimate of the true ratio as measured by the figures reported to the SEC. Third, our analysis captures the ratio of CEO compensation to U.S. domestic workers, which provides comparability that the SEC required ratios do not provide. Fourth, our series is able to extend back to 1965, providing an opportunity to analyze trends in executive compensation over time. The consistent basis of the measurement of our ratios permits historical comparisons on a year-to-year basis. These (and other) benefits justify the continued production of our CEO-to-worker pay series—although it is our hope that with time the ambiguities of the SEC ratio will be addressed and adjusted, to produce a reliable time series for investors and the public to use. In terms of CEO compensation based on realized stock options, CEOs of major U.S. companies earned 20 times more than a typical worker in 1965. This ratio grew to 30-to-1 in 1978 and 58-to-1 by 1989. It surged in the 1990s, hitting 344-to-1 in 2000, at the end of the 1990s recovery. The fall in the stock market after 2000 reduced CEO stock-related pay (e.g., realized stock options) and caused CEO compensation to tumble in 2002, to 177 times typical worker pay, before beginning to rise again in 2003. CEO compensation recovered to a level of 327 times worker pay by 2007, almost back to its 2000 level. The financial crisis of 2008 and accompanying stock market decline reduced CEO compensation between 2007 and 2009, as discussed above, and the CEO-to-worker compensation ratio fell in tandem. By 2014 the stock market had recouped all of the value it had lost following the financial crisis, and the CEO-to-worker compensation ratio in 2014 had recovered to 284-to-1. The fall in CEO compensation between 2014 and 2016 caused the CEO-to-worker pay ratio to fall to 270-to-1; the sharp upward spike in CEO compensation in 2017 lifted the CEO-to-worker compensation ratio to 312-to-1. Although the CEO-to-worker compensation ratio remains below the values achieved earlier in the 2000s at the peak of the stock market bubble, it is far higher than it was in the 1960s, 1970s, 1980s, and 1990s. The pattern using the CEO compensation measure that values stock options as they are granted is similar. The CEO-to-worker pay ratio peaked in 2000, at 361-to-1 even higher than the ratio with the stock-options-realized measurement. The fall from 2000 to 2007 was steeper than for the other measure, hitting 227-to-1 in 2007. The stock market decline during the financial crisis drove the ratio down to 176-to-1 in 2009. It recovered to 213-to-1 by 2014 and remained flat thereafter, rising to 221-to-1 in 2017. This level is far lower than its peak in 2000 but still far greater than the 1989 ratio of 42-to-1 or the 1978 ratio of 22-to-1. Does dramatically high CEO pay simply reflect the market for skills? 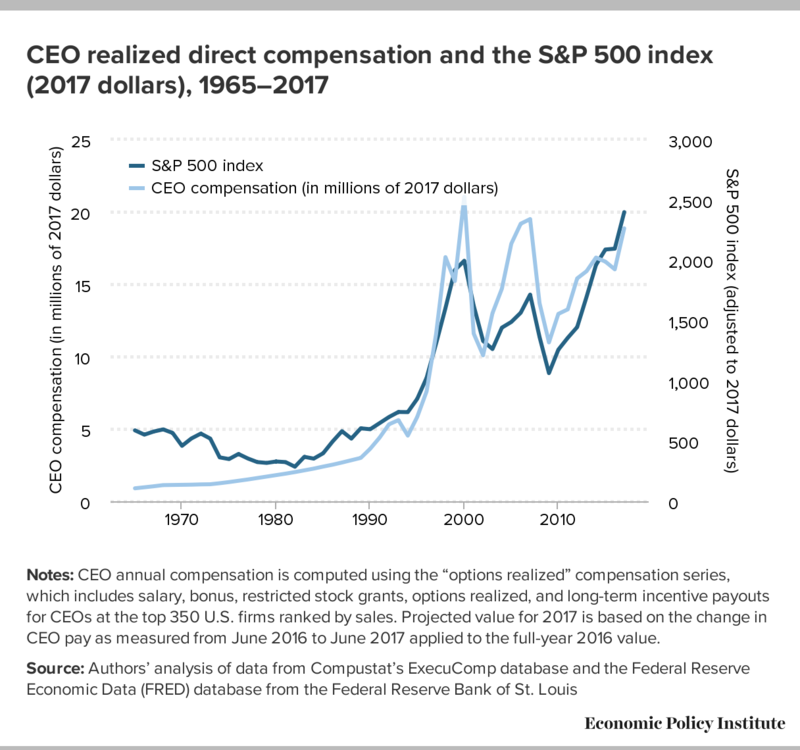 This section reviews competing explanations for the extraordinary rise in CEO compensation over the past several decades. CEO compensation has grown a great deal since 1965, but so has the pay of other high-wage earners. To some analysts, this suggests that the dramatic rise in CEO compensation was driven largely by the demand for the skills of CEOs and other highly paid professionals. In this interpretation, CEO compensation is being set by the market for “skills” or “talent,” not by managerial power or rent-seeking behavior. This explanation lies in contrast to that offered by Bebchuk and Fried (2004), who claim that the long-term increase in CEO pay is a result of managerial power. The argument that CEO compensation is being set by the market for “skills” does not square with the data. Bivens and Mishel (2013) address the larger issue of the role of CEO compensation in generating income gains at the very top and conclude that substantial rents are embedded in executive pay. According to them, CEO pay gains are not the result of a competitive market for talent but rather reflect the power of CEOs to extract concessions. We draw on and update their analysis to show that CEO compensation grew far faster than compensation of very highly paid workers over the last few decades, which suggests that the market for skills was not responsible for the rapid growth of CEO compensation. To reach this finding, we use Kaplan’s series on CEO compensation and compare it with the wages of top wage earners rather than the household income of the top 0.1 percent, as Kaplan did.6 The wage benchmark seems the most appropriate one, because it avoids issues of household demographics (e.g., changes in two-earner couples) and limits the income to labor income (i.e., excludes capital income). We update Kaplan’s series beyond 2010 using the growth of CEO compensation in our own series. This analysis finds, contrary to Kaplan, that the compensation of CEOs has far outpaced that of very highly paid workers, the top 0.1 percent of earners. For comparison purposes, Table 2 also shows the changes in the gross (not regression-adjusted) college-to-high-school wage premium. This premium, which is simply how much more pay is earned by workers with a college degree relative to workers with just a high school degree is useful because some commentators, such as Mankiw (2013), assert that the wage and income growth of the top 1 percent reflects the general rise in the return to skills, as reflected in higher college wage premiums. (The comparisons end in 2016 because 2017 data for top 0.1 percent wages are not yet available). In 2016 CEO pay was 5.45 times the pay of the top 0.1 percent of wage earners, up from 2015 (despite the decline in compensation in 2016) and substantially higher than the 4.31 ratio in 2007. Since 2007 CEO compensation has thus grown far more rapidly than did the wages of the top 0.1 percent of earners. 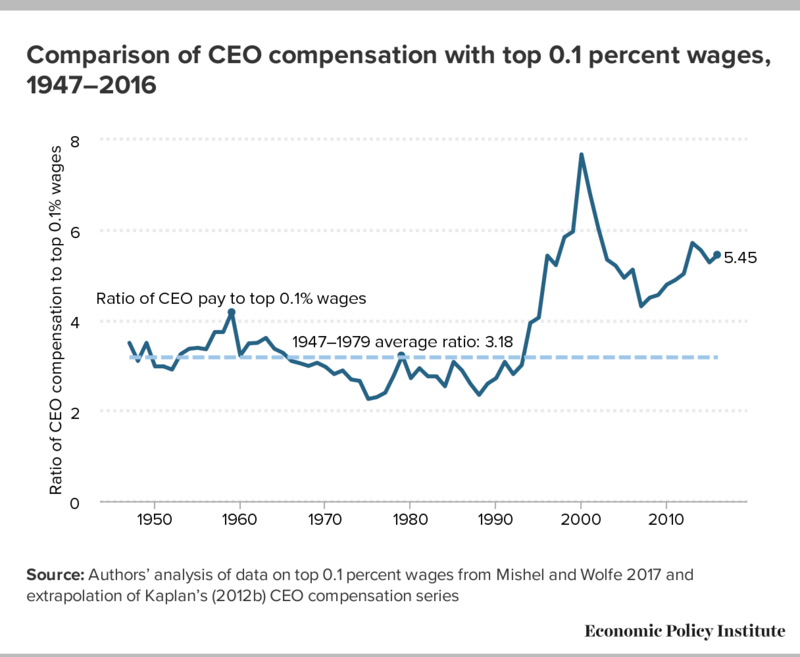 CEO compensation relative to the wages of the top 0.1 percent of wage earners in 2016 far exceeded the ratio of 2.60 in 1989, a rise (2.86) equal to the pay of almost three very-high-wage earners (a one-point rise in the ratio is the equivalent of the average CEO earning an additional amount equal to that of the average earnings of someone in the top 0.1 percent). The log ratio of CEO relative pay grew 74 log points with respect to wage earners in the top 0.1 percent. Is this increase large? Kaplan (2012a, 4) concludes that CEO relative pay “has remained relatively constant or declined.” He finds that the ratio “remains above its historical average and the level in the mid-1980s” (2012b, 14). His historical comparisons are inaccurate, however. Figure D compares the ratios of the compensation of CEOs and top 0.1 percent of wage earner ratios back to 1947. In 2016 this ratio was 5.45, 2.27 points higher than the historical average of 3.18 (a relative gain in wages earned by the equivalent of 2.27 high-wage earners). If CEO pay growing far faster than that of other high earners is a test of the presence of rents, as Kaplan suggests, one would conclude that today’s top executives are collecting substantial rents, meaning that if they were paid less there would be no loss of productivity or output. The large discrepancy between the pay of CEOs and other very-high-wage earners also casts doubt on the claim that CEOs are being paid these extraordinary amounts because of their special skills and the market for those skills. It is unlikely that the skills of CEOs of very large firms are so outsized and disconnected from the skills of others that they propel CEOs past most of their cohorts in the top 1/10th of the top 1 percent. For everyone else, the distribution of skills, as reflected in the overall wage distribution, tends to be much more continuous. High CEO pay reflects economic rents—concessions CEOs can draw from the economy not by virtue of their contribution to economic output but by virtue of their position. Clifford (2017) describes the Lake Wobegon world of setting CEO compensation that fuels its growth: Every firm wants to believe its CEO is above average and therefore needs to be correspondingly remunerated. CEO pay could be reduced and the economy would not suffer any loss of output. Average CEO compensation (based on stock options realized) spiked upward by 17.6 percent in 2017. The spurt in CEO compensation reflects the underlying growth in the stock-related components of compensation, both stock awards and stock options realized. Compensation of the bottom 80 percent grew just 0.2 percent in 2017, continuing the trend of sluggish compensation growth for the vast majority. CEO compensation is historically high, although it remains below the levels attained in 2000 and 2007. Several policy options could reverse the trend of excessive executive pay and broaden wage growth. Some involve taxes. Implementing higher marginal income tax rates at the very top would limit rent-seeking behavior and reduce the incentives for executives to push for such high pay. Another option is to set corporate tax rates higher for firms that have higher ratios of CEO-to-worker compensation. Clifford (2017) recommends setting a cap on compensation and taxing anything over the cap, similar to the way baseball team payrolls are taxed when they exceed a cap. Other policies that could potentially limit executive pay growth are changes in corporate governance, such as greater use of “say on pay,” which allows a firm’s shareholders to vote on top executives’ compensation. The authors thank the Stephen Silberstein Foundation for its generous support of this research. Steven Balsam, an accounting professor at Temple University and author of a book on executive compensation (Balsam 2013), provided useful advice on data construction and interpretation. Lawrence Mishel is a distinguished fellow and former president of the Economic Policy Institute. He is the co-author of all 12 editions of The State of Working America. His articles have appeared in a variety of academic and nonacademic journals. His areas of research include labor economics, wage and income distribution, industrial relations, productivity growth, and the economics of education. He holds a Ph.D. in economics from the University of Wisconsin at Madison. Jessica Schieder is an economic analyst for the Economic Policy Institute and the Economic Analysis and Research Network. Her areas of research include wage trends, executive compensation, gender and racial wage gaps, and social protection. She holds a master’s degree in international development from Georgetown University. 1. There were 38,824 executives in publicly held firms and 9,692 people in the top 0.1 percent of wage earners in 2007, according to the Capital IQ database (tabulations provided by Temple University professor Steve Balsam). 2. We chose which years to present in the table in part based on data availability. Where possible, we chose cyclical peaks (years of low unemployment). 3. In previous reports, the sample in a year had fewer than 350 firms, because there were no data for large firms that did not have the same CEO for most of or all of the year or the compensation data were not reported. The samples now include the largest firms (by revenue), which report executive compensation. We revised the data back to 1992 accordingly, using ExecuComp data from Compustat. Establishing these criteria for inclusion in the sample prevents potentially volatile shifts in the composition of firms in the sample because of missing data from influencing the level and trends in compensation. By establishing 350 firms in the sample, we are forcing some smaller firms with lower executive compensation into it, thereby lowering the average compensation and the average CEO-to-worker compensation ratio. 4. Most Fortune 500 companies release annual financial data in early spring; the data are included in samples limited to the first half of the year. However, the date we present for previous years includes all of the data that were released during each calendar year. This creates a bias in comparing data for the first half of the year relative to the full year’s data in the prior or earlier years: compensation levels for the full year’s data are higher than compensation in the data limited to the first half. A comparison of data available in June thus shows a smaller increase when compared with the previous year’s full data than a comparison with the data that were available at the same time a year earlier. We analyzed the impact of this bias and found that the vast majority of top firms remain unchanged between the samples for the first half and the full year. However, there is churn among the smaller firms in the sample. Among firms with lower net annual sales, average CEO compensation tends to be higher in the full-year sample. Additionally, in recent years firms reporting later in the year have tended to be firms with lower worker compensation levels and therefore higher CEO-to-worker compensation ratios. 5. There are a limited number of firms, which existed only for certain years between 1992 and 1996, for which a North American Industry Classification System (NAICS) value is unassigned. This makes it not possible to identify the pay of the workers in the firm’s key industry. In these cases these firms are not included in the calculation of the CEO-to-worker compensation ratio. 6. We thank Steve Kaplan for sharing his CEO compensation series with us. The series on the income of the top 0.1 percent of households that Kaplan used is no longer available. Moreover, as we discuss, the appropriate comparison is to other earners, not to households, which could have multiple earners and shifts in the number of earners over time. 7. Temple University professor Steve Balsam provided tabulations from the Capital IQ database of annual wages of executives exceeding the wage thresholds (provided to him) that place them in the top 0.1 percent of wage earners. The 9,692 executives in publicly held firms who were in the top 0.1 percent of wage earners had average annual earnings of $4.4 million. Using Mishel et al.’s (2012) estimates of top 0.1 percent wages, we find that executive wages make up 13.3 percent of total top 0.1 percent wages. One can gauge the bias of including executive wages in the denominator by noting that the ratio of executive wages to all top 0.1 percent wages in 2007 was 2.14 but the ratio of executive wages to nonexecutive wages was 2.32. We do not have data that would permit an assessment of the bias in 1979 or 1989. We also lack information on the number and wages of executives in privately held firms; to the extent that their CEO compensation exceeds that of publicly traded firms, their inclusion would indicate an even larger bias. The Internal Revenue Service reports that there were nearly 15,000 corporate tax returns in 2007 of firms with assets exceeding $250 million, indicating that there are many more executives of large firms than just those in publicly held firms. 8. Kaplan (2012b, 14) notes that the Frydman and Saks series grew 289 percent whereas the Hall and Liebman series grew 209 percent. He also notes that the Frydman and Saks series grows faster than the series reported by Murphy (2012). Bakija, Jon, Adam Cole, and Bradley Heim. 2010. “Job and Income Growth of Top Earners and the Causes of Changing Income Inequality: Evidence from U.S. Tax Return Data.” Department of Economics Working Paper 2010-24, Williams College, November 2010. Bakija, Jon, Adam Cole, and Bradley Heim. 2012. “Job and Income Growth of Top Earners and the Causes of Changing Income Inequality: Evidence from U.S. Tax Return Data.” Department of Economics Working Paper, Williams College, February 2012. Balsam, Steven. 2013. Equity Compensation: Motivations and Implications. Washington, D.C.: WorldatWork Press. Bebchuk, Lucian, and Jesse Fried. 2004. Pay without Performance: The Unfulfilled Promise of Executive Remuneration. Cambridge, Mass. : Harvard Univ. Press. Bivens, Josh, and Lawrence Mishel. 2013. “The Pay of Corporate Executives and Financial Professionals as Evidence of Rents in Top 1 Percent Incomes.” Economic Policy Institute Working Paper no. 296, June 2013. Bureau of Economic Analysis. Various years. National Income and Product Accounts (NIPA) Tables [online data tables]. Tables 6.2C, 6.2D, 6.3C, and 6.3D. Bureau of Labor Statistics. 2015. “Occupational Employment and Wages—May 2014” [news release]. Bureau of Labor Statistics. Various years. Employment, Hours, and Earnings—National [database]. In Current Employment Statistics [public data series]. Clifford, Steven. 2017. The CEO Pay Machine: How It Trashes America and How to Stop It. New York: Penguin Random House. Compustat. Various years. ExecuComp [commercial database]. Frydman, Carola, and Raven E. Saks. 2010. “Executive Compensation: A New View from a Long-Term Perspective, 1936–2005.” Review of Financial Studies 23: 2099–2138. Gould, Elise. 2018. The State of American Wages 2017: Wages Have Finally Recovered from the Blow of the Great Recession but Are Still Growing Too Slowly and Unequally. Economic Policy Institute, March 2018. Hall, Brian J., and Jeffrey B. Liebman. 1997. “Are CEOs Really Paid Like Bureaucrats?” National Bureau of Economic Research Working Paper no. 6213, October 1997. Kaplan, Steven N. 2012a. “Executive Compensation and Corporate Governance in the U.S.: Perceptions, Facts, and Challenges.” Martin Feldstein Lecture. National Bureau of Economic Research, Washington, D.C., July 10, 2012. Kaplan, Steven N. 2012b. “Executive Compensation and Corporate Governance in the U.S.: Perceptions, Facts, and Challenges.” National Bureau of Economic Research Working Paper no. 18395, September 2012. Mankiw, N. Gregory. 2013. “Defending the One Percent.” Journal of Economic Perspectives 27, no. 3: 21–24. Mishel, Lawrence. 2013a. “Greg Mankiw Forgets to Offer Data for His Biggest Claim.” Working Economics (Economic Policy Institute blog), June 25, 2013. Mishel, Lawrence. 2013b. “Working as Designed: High Profits and Stagnant Wages.” Working Economics (Economic Policy Institute blog), March 28, 2013. Mishel, Lawrence, and Jessica Schieder. 2016. Stock Market Headwinds Meant Less Generous Year for Some CEOs. Economic Policy Institute, July 2016. Mishel, Lawrence, and Jessica Schieder. 2017. CEO Pay Remains High Relative to the Pay of Typical Workers and High-Wage Earners. Economic Policy Institute, July 20, 2017. Mishel, Lawrence, and Julia Wolfe. 2017. “Wages Rose for the Bottom 90 Percent in 2016 as Those for Top 1 Percent Fell.” Working Economics (Economic Policy Institute blog), October 31, 2017. Murphy, Kevin. 2012. “The Politics of Pay: A Legislative History of Executive Compensation.” University of Southern California Marshall School of Business Working Paper no. FBE 01.11. Sabadish, Natalie, and Lawrence Mishel. 2013. “Methodology for Measuring CEO Compensation and the Ratio of CEO-to-Worker Compensation: 2012 Data Update.” Economic Policy Institute Working Paper no. 298, June 2013. Securities and Exchange Commission (SEC). 2015. “SEC Adopts Rule for Pay Ratio Disclosure: Rule Implements Dodd-Frank Mandate While Providing Companies with Flexibility to Calculate Pay Ratio” (press release no. 2015-160), August 5, 2015. Staff of Congressman Keith Ellison. 2018. Rewarding or Hoarding? An Examination of Pay Ratios Revealed by Dodd-Frank. May 2018.